Our existence as human beings is heavily influenced by the spaces and people around us. Intimate spaces, such as home, are intertwined with the people we include in the personal corners of our lives. What happens, then, when you lose one of those special people? The spaces turn into a living representation of the memories shared with those special people, a reminder of the life lost. The space I recreated is the left wall of my Grandparent’s living room— the last place I saw my Grandfather, before he died of stage 4 lung cancer. Although I lost him three years ago, I did not begin properly processing my grief until this year. Through my self-therapy and opening up to the people around me, I noticed how hard it is to process the abstract concept of death in American society. This concerned me, as everyone deserves to have the support they need with grappling the anxiety of their mortality and the sudden visit of death. 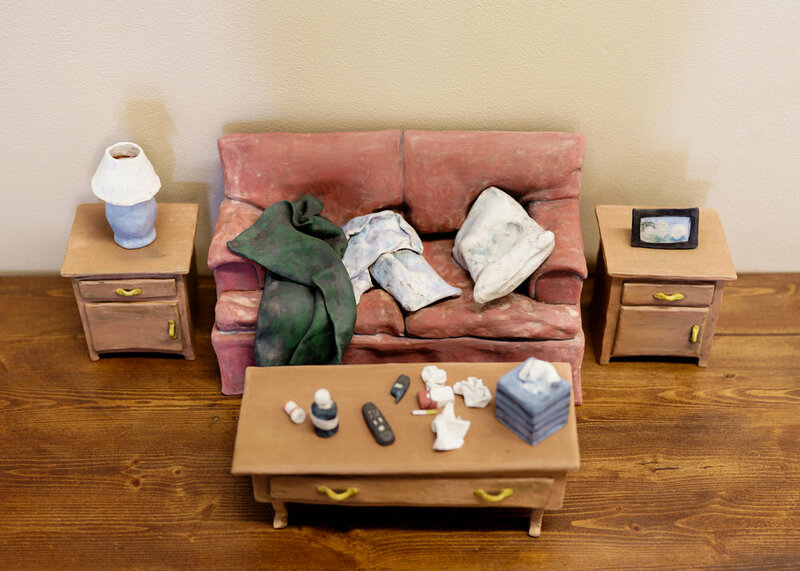 Excluding the physical representation of my Grandfather from the piece, I connect grief with the emotions projected onto a personal space through remnants of his existence in the form of pill bottles, tissues, messy pillows and blankets. Through my work, constructed entirely from memory, I am evoking a feeling of nostalgia, curiosity, and a pang of melancholy in my viewers. Using this installation of red earthenware clay furniture as a vehicle, I am reaching out to my audience and creating a space for them to be vulnerable to the idea of mortality. I encourage my audience to acknowledge their feelings and to be open to sharing and receiving support in our struggle with death.